I stepped into a virtual tour of the Metropolitan Museum of Art and paused to read about a Greek marble relief showing Persephone and Demeter. You might remember the myth as I do. Persephone is kidnapped by Hades and tricked into remaining in the underworld for several months each year. 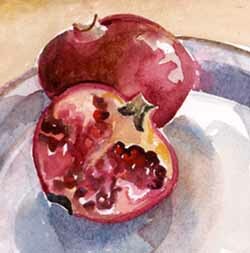 He tempts her with the divinely ripe red seeds of the pomegranate.